At Sabre, we have taken a proactive, industry-leading approach to changing the technological status quo that exists today. Our approach leverages modern technology and harnesses the power of airline data. It drives operational efficiency, profitability and productivity while helping improve customer experience. We call this approach The Connected Airline, which is delivered through our operations suite of solutions, Sabre AirCentre. 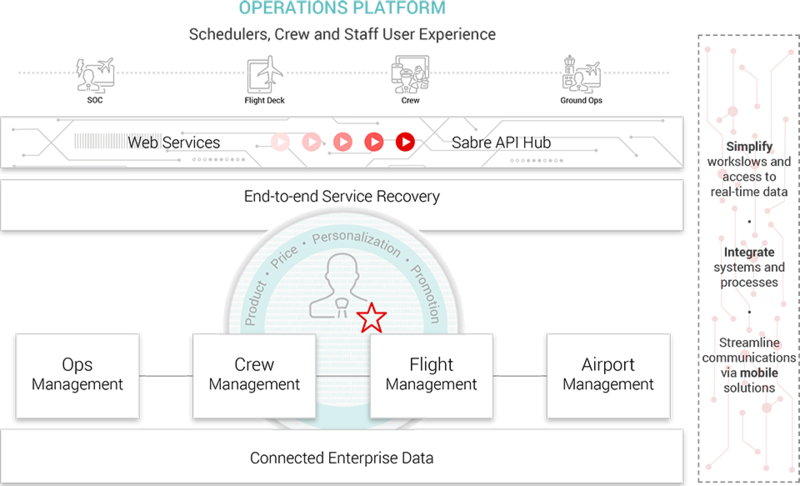 With Sabre AirCentre, our next-generation technology supports the future needs of an airline and breaks down silos across its operations. Regardless of department or function, an airline’s operations departments need common, streamlined access to data. They also need solutions that are efficient and easy to use. Real-time insights and streamlined workflows drives faster and better decisions across the entire operations side of your business. Operations must adapt quickly to constant change while responding with decisions that consider what’s best for an airline as a whole – not just a single department. To facilitate collaborative decision-making, airlines need integrated systems that share information and allow functions to provide and consume inputs from one another. An airline’s workforce should receive the latest and most accurate operational information regardless of their cockpit, terminal or runway location. Mobile solutions provide real-time updates so employees can adapt and respond efficiently when things change. Mobile technology also empowers employees with self-service options to manage their own schedules and tasks.